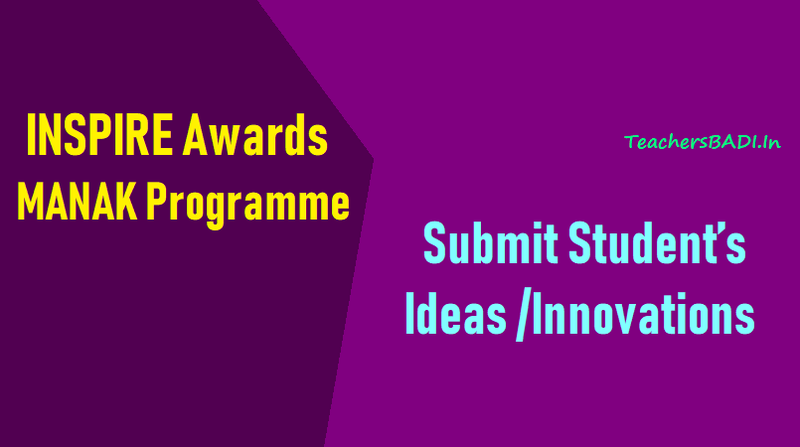 Submit Student’s Ideas /Innovations under INSPIRE Awards MANAK Programme on http://www.inspireawards-dst.gov.in). INSPIRE Awards-MANAK (Million Minds Augmenting National Aspirations and Knowledge) programme: 'Innovation in Science Pursuit for Inspired Research' (INSPIRE) scheme is one of the flagship programme of Department of Science & Technology (DST), Government of India. The scheme covers students in the age group of 10-32 years and has five components. Inpire Online nomination for the year 2019-2020 has been opened. The first component, INSPIRE Awards - MANAK (Million Minds Augmenting National Aspirations and Knowledge) is being executed by National Innovation Foundation – India (NIF) and Department of Science & Technology (DST). It aims to motivate students in the age group of 10-15 years and studying in classes 6 to 10, to pursue Science and a Career in Research. The scheme is aligned with the Action Plan for "Start-up India" initiative launched by the Hon'ble Prime Minister of India. The objective of the scheme is to target one million original ideas/innovations rooted in science and societal applications to foster a culture of creativity and innovative thinking among school children. This will help address the societal needs through science and technology and nurture them to become sensitive and responsible citizens and innovation leaders of tomorrow. Under this scheme student may submit innovative ideas / innovations through schools in any Indian language and the best 1 lakh ideas/projects will receive Rs. 10,000/- per student through Direct Benefit Transfer (DBT) and get a chance to participate in District Level Competition. Ten per cent students will be shortlisted further to participate at State level Competition. One thousand students will showcase their innovations at National level and finally, sixty innovative projects will be incubated completely (patent filing, value addition in technology and product development etc.) by NIF and will be displayed at Festival of Innovation and Entrepreneurship (FINE) at Rashtrapati Bhavan, New Delhi. The schools may submit student’s ideas/innovations in prescribed format on E-MIAS (http://www.inspireawards-dst.gov.in). NIF has requested you to please organize an idea/innovation competition in your schools and submit best of 2 to 3 ideas/innovations immediately. NIF is looking forward for your active participation. Awareness and capacity building of District and State level functionaries across the country through regional workshop and audio-visual tools and literature. Forwarding of nominations by District/State authorities to Department of Science and Technology through E-MIAS. Shortlisting of top 1,00,000 ideas, with potential to address societal needs through Science & Technology, by NIF. Disbursement of INSPIRE Award of INR 10,000 into bank accounts of students under Direct Benefit Transfer scheme. Organisation of State Level Exhibition & Project Competition (SLEPC) for further shortlisting of top 1,000 ideas/innovations. At this stage, NIF will provide mentoring support to students for the development of prototypes, in coordination with the reputed academic and technology institutions of the country.. Selection of ideas/innovations will be based on novelty, social applicability, environment friendliness, user friendliness and comparative advantage over the existing similar technologies. Consideration of top 60 ideas/innovations by NIF for product/process development and their linkage with other schemes of NIF/DST and display of top innovations at the Annual Festival of Innovation and Entreprenureship (FINE) at Rashtrapati Bhavan. The teachers may also look up EMIAS portal (http://www.inspireawards-dst.gov.in/UserP/inspire-downloads.aspx) to see if the projects being developed by their wards have been not recognised already. This will help ensure originality and maintain the standard of the competition. While selecting the projects the principals and jury members should bear in mind the degree of novelty of the idea, its social applicability and end use, environmental implications, potential impact, scope for diffusion through commercial and/or non-commercial channels, relevance to existing government schemes etc. may be considered. The selection criteria will be based on innovation, creativity and novelty of the project that a student proposes to undertake, as submitted in the synopsis. DST/NIF will make conscious effort to represent girls and students belonging to SC/STs. 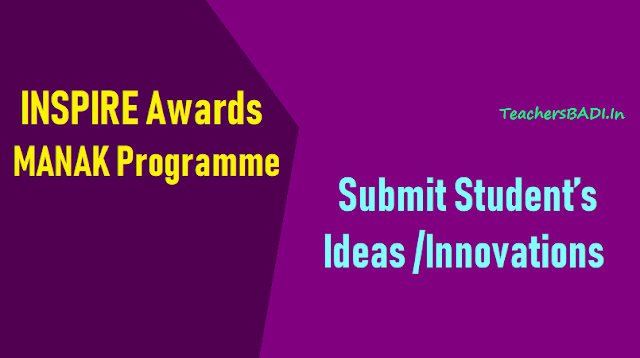 Timeline for submission of ideas/innovations: Online nomination for the year 2018-19 has been opened. The schools will be able to submit their nominations till August 31, 2019. In order to create awareness of INSPIRE Awards - MANAK scheme amongst the people, regional workshops and innovation workshops. The regional workshops will be organised prior to the submission of entries for the competition and the participants comprising of teachers, principals, district and state-level functionaries will be informed about the revised scheme and sensitised about the need for innovation. The innovation workshops will be organised before the national level event at various R&D and engineering institution. The focus will be on teaching the children basics about prototype development and improving the quality of products displayed at national-level exhibition. In this process children will gain knowledge by interacting with students and faculty form various engineering and design institutions.